In December 2017, Old Mutual Wealth (now Quilter plc), announced that it had agreed to sell Old Mutual Global Investors (OMGI), its single strategy asset management business. Following the recent completion of the sale of OMGI to the OMGI management team and a company called TA Associates, that business is no longer associated with the Old Mutual name or brand, or that of their parent company (Quilter). The business, therefore, needed to change to a different name to reflect its identity as a separate company. Although Merian Global investors is a new company, who are building for the future the funds they now manage have been long established and combined they hold almost £30 billion of client money. 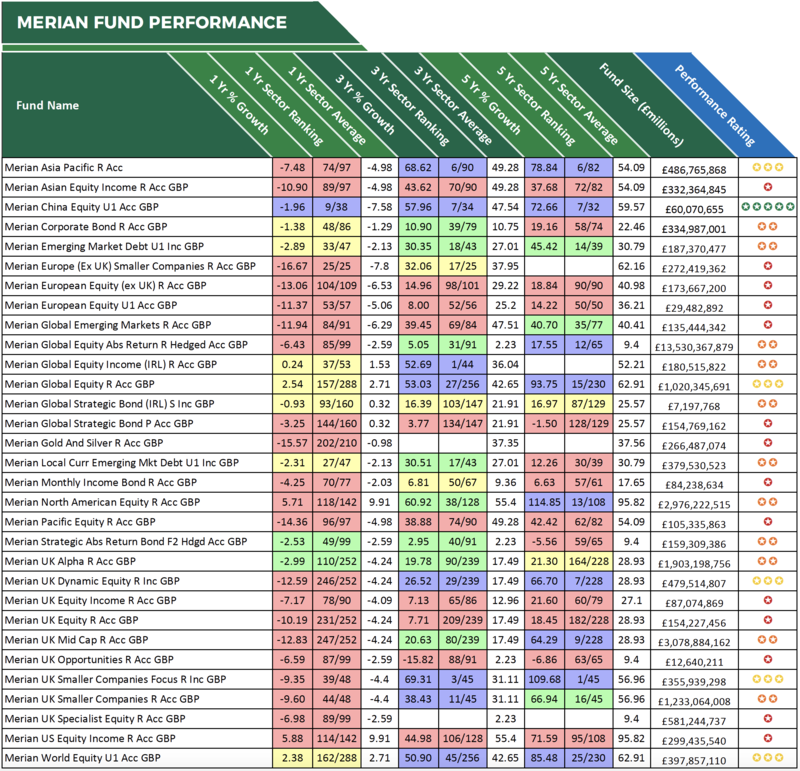 To find out how these funds have performed we analysed all 31 Merian funds for performance and sector ranking over the recent 1, 3 & 5-year periods up to 1st December 2018. As identified in this report, they have their work cut out for them as over 80% of the funds they inherited have a history of poor performance. This analysis provides an insight into the performance of 31 funds managed by Merian Global Investors. On display are the last 1, 3 & 5-year cumulative growth figures for each fund up to 1st December 2018. 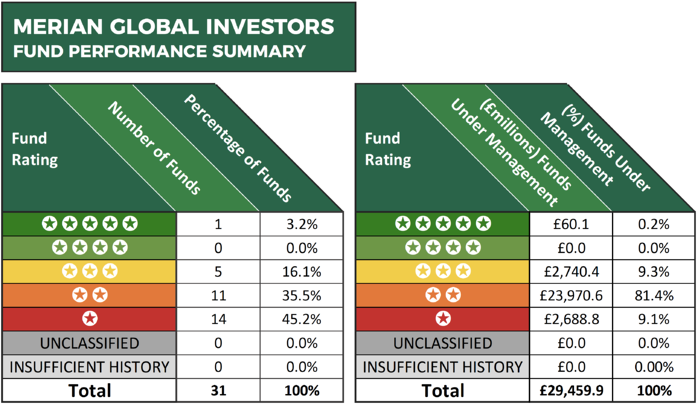 Each fund has been provided with a performance rating between 1 and 5-stars based on how well they ranked when compared alongside all other competing same sector funds. Only 1 of the 31 funds reviewed has managed to maintain a level of performance over the recent 1, 3 & 5 year periods that was better than at least three-quarters of their competitors. This fund was the Merian China Equity fund, which happens to be one of their least invested funds with just over £60million of client assets under its management. This funds objective is to deliver long-term capital appreciation and currently it invests almost entirely in companies in China and Hong Kong. Like many other markets, the past 12-months has been a difficult time for the Chinese market, with average returns of -7.58% in the IA China / Greater China sector. Despite this the Merian China Equity fund held firm, and although it returned negative growth of -1.96%, it was still one of the best performers in its sectors. Over the past 3 and five year periods it outperformed at least 78% of its competitors within the same sector with cumulative growth of 57.96%, and 72.66% respectively. With over £3 billion of client assets under its management, the Merian UK Mid Cap fund is their second largest fund. Formerly known as the Old Mutual UK Mid Cap fund, this popular fund has long been a favourite of UK investors who were attracted by its competitive returns. Indeed, over the past 5-years, this fund has returned cumulative growth of 64.29%, which ranked an impressive 9th out of 228 funds in the same sector with at least 5-years performance history. However, in recent years this fund has struggled for performance, and over the past 12-months, it returned negative growth of -12.83%, which ranked 247th out of 252 funds within the same sector with at least one year's history. Over The Past Year, 90% of Merian Funds Have Performed Worse Than At Least Half of All Competing Funds. When it comes to fund performance, the past 12-months have been extremely challenging for Merian and their funds. 68% of Merian funds delivered returns that were worse than at least 75% of their peers, and 90% had returns that we worse than at least half of their peers. Among the worst performers of the past year was the Merian Pacific Equity fund, which returned negative growth of -14.36% to rank 96th out of 97 funds in its sector. 9 of the 31 funds have consistently ranked in the bottom quartile of their sector for performance over each of the 1, 3 & 5-year periods that were analysed. One such fund was the Merian Global Strategic Bond fund. Over the past 5-years, this fund has failed to return a profit for its investors as its negative growth of -1.5% to rank 128th out of 129 funds in the same sector. Another fund that has returned negative growth over the past 5-years was the Merian UK Opportunities fund. This fund sits within the IA Targeted Absolute Return sector and over the recent 1, 3 & 5-years periods it returned negative growth of -6.59%, -15.82%, and -6.86% as it consistently ranked as one of the worst funds in its sector. Although the funds analysed in this report are now branded as Merian funds their long-term performance, to date, has primarily been as a result of Old Mutual and their fund managers. Therefore, as a new firm with ambitious objectives, it remains to be seen whether or not Merian and their team of fund managers can improve the performance of the funds they have inherited. Nevertheless, the fact remains that the significant proportion of Merian branded funds have a history of poor performance with the majority of their peers delivering better returns for their investors.